Orbitrack Bike 4 Handle with Dumbbells has been designed for cardiovascular exercise while the dumbbells can be used for a wide range of exercises. By using this two fitness equipment, you can train the entire body. The elliptical bike lets you burn calories during workout so you are guaranteed best results. It can be used by both menand women or anyone who wants to have a fit body. constant fitness Orbitrack Eliptical Bike is very easy to use and it features an LCD screen that shows Pulse, Calorie count, Time, Speed and Distance, this will enable you monitor your workout progress. 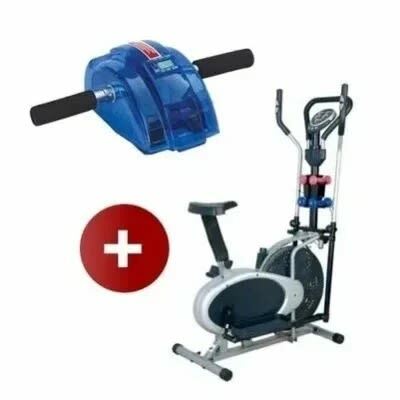 Using the constant fitness Orbitrack Eliptical Bike with Dumbbells will ensure your heart pumps properly and will also help your lungs use oxygen efficiently. The ellipticalbike will give you full aerobic workout which will help in lowering blood pressure and ensuring healthy heart. The good thing about this fitness equipment is that youcan use it at the intensity that suits you. It has a compact design so it won't take up much space in your home. Having this in your house will go a long way inensuring you have the perfect healthy body. By combining the elliptical machine and dumbbells, you can have a well-balanced workout routine. Orbitrack elliptical bike for cardiovascular exercise. It is essential for loosing weigh. It has an LCD screen showing. Transparent Roller Slide with EVA mat Ab Slider allow you to slim, tone, and firm your muscles.Abdominal Fitness Equipment works your abs, arms, shoulders and waist.Ab roller slide is compact, portable, and helps one to achieve the abs wanted.The smooth gliding action is the simple and effective secret of ab slider moving forwards and back will do the trick.The unique progressive power range of the ab slider makes it highly effective and targets the areas you need to work on most.Abdominal Fitness Equipment Ab Slider is the totally fast and easy way to shed inches, build muscles, and tone those "hard to" areas of the body. The Ab Roller Slide lets you do many excercises like abdominal stretch, seated hamstring stretch, v-hamstring stretch, shoulder and bicep stretches, therapy stretches, vertical lat stretches and more. The Roller Slide is a complete upper body workout that shaps, tones and strengthens in just minutes a day. With this abdominal fitness equipment one can work on abs, waistline, obliques, arms, chest, back, and shoulders. Ab slider is the latest in abdominal exercise equipment intended for fast, effective ab exercise. Ab roller slide is compact, portable, and helps you achieve the abs you've always wanted. The unique progressive power range of the ab slider makes it highly effective and targets the areas you need to work on most. The smooth gliding action is the simple and effective secret of ab slider moving forwards and back will do the trick.